There was a recent news item taken from an article in Pediatrics examining what happens when computerized language assistance services (LAS) are imperfect. It focused on the erroneous translation of prescription information from English to Spanish in pharmacies in New York and possible consequences. That was similar to an aspect of our LAS research we highlighted in an interview in The Oncology Pharmacist several months ago. We are examining related problems as well, including low- and high-tech solutions to varying issues with LAS (e.g. automated LAS kiosks, natural language processing, pictographs). 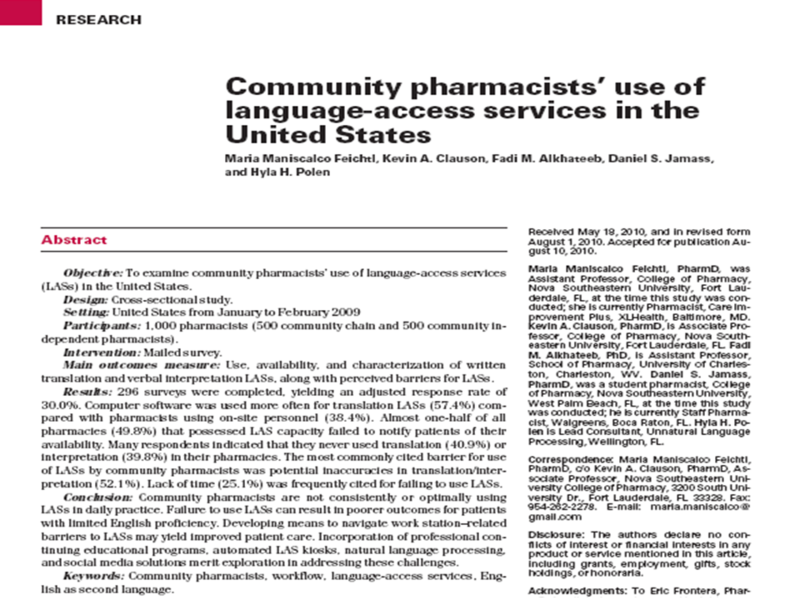 In December 2009, we presented a poster of the results of a national survey of the use of language assistance services (sometimes called language access services) in community pharmacies. One of the major concerns in using LAS cited by pharmacists (52.1%) in our study was about mistakes made with translations (written) and interpretations (verbal). Their concerns appear to be at least somewhat justified based on the results of the Pediatric study. This is a contributing factor as to why almost half (49.8%) of pharmacists in our survey who have LAS fail to notify their patients of its availability. How easy is it to read dietary supplement patient leaflets? One of the aspects of information quality that is still very much an imperfect science is readability. There are a handful of established tools to evaluate it, with the Flesch Kincaid Grade Level (FKGL) being the best known. The FKGL is simple and thus limited. I first met Qing Zeng when I was giving a poster presentation during Mednet in Toronto in 2006 (Mednet later morphed into Medicine 2.0). We exchanged some ideas and our business cards, and that was it for awhile. We reconnected at AMIA and formally explored some research ideas. One area of potential collaboration revolved around a tool her group was developing called the Health Information Readability Analyzer (HIReA). Fast forward to today. The paper resulting from that initial collaboration was just published in the Journal of Alternative and Complementary Therapies. In it, we used HIReA and FKGL to evaluate the readability of patient and professional leaflets. We focused on leaflets of dietary supplements (e.g. ginseng, fish oil, SAMe) used in a common (i.e. diabetes) and less prevalent (i.e. chronic fatigue syndrome) condition. The patient-targeted leaflets ended up being much more difficult to read than their desired level by both measures. Part of this may be due to the fact that the leaflets were not created specifically for consumers, they were just scaled down versions of leaflets originally tailored for clinicians and researchers. Hopefully our results will help provide some guidance as more patient-targeted health information is created, as well as serve as an introduction of HIReA in a broader forum. Note: If anyone happens to get a glimmer of recognition from the name HIReA, this was also the tool later used to assess the readability of the top 50 prescribed drugs in Wikipedia presented at Medicine 2.0 in 2009 and later at other venues. Our JACM article goes in-depth about the HIReA tool and will likely address many of the questions people have had about it at the various presentations in conjunction with the Wikipedia study.